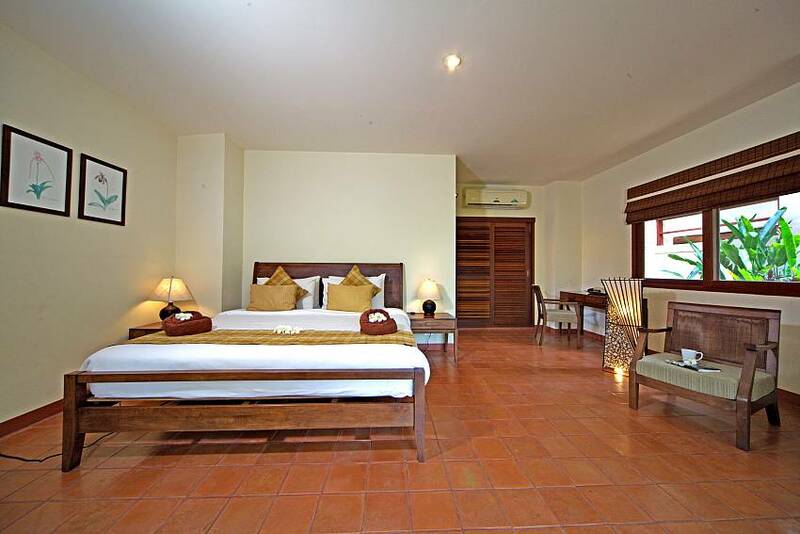 Your 3 en-suite bedroom Summitra Pavilion Villa No. 7 places a strong emphasis on nature. 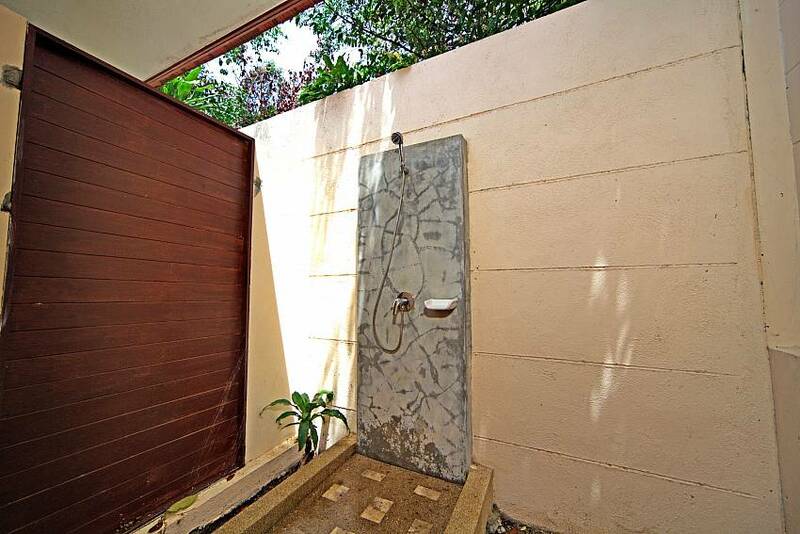 It is set in 400 sq. 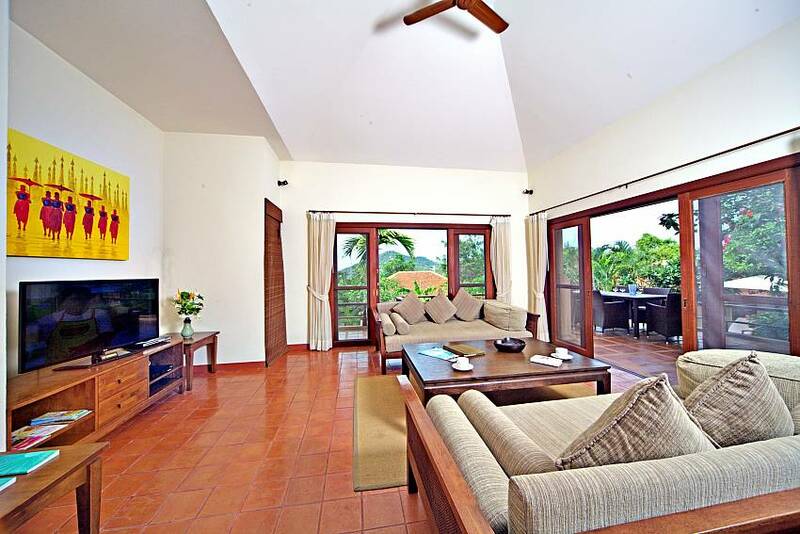 metres of tropical landscaped garden with the living and sleeping accommodation spread over 3 pavilions. 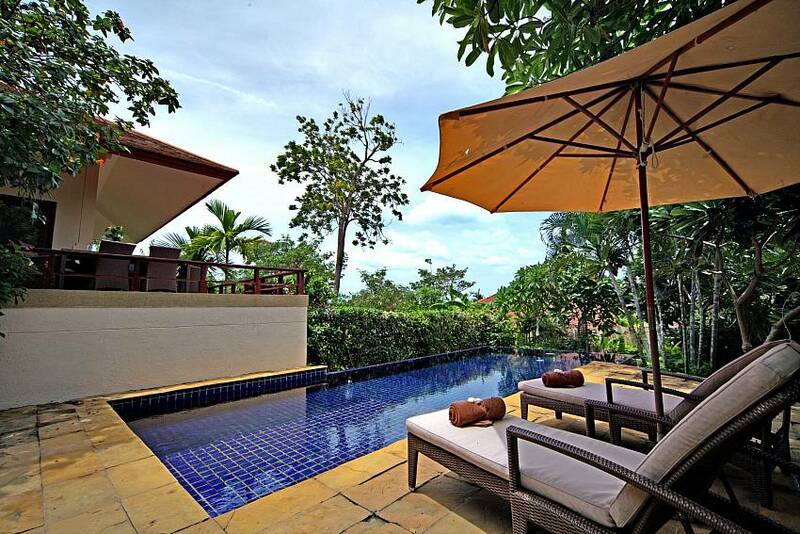 There is also an outdoor sala which is purpose built for relaxation, but the private swimming pool and spacious outdoor terrace with dining suite are likely to be the two most popular spots during your stay. 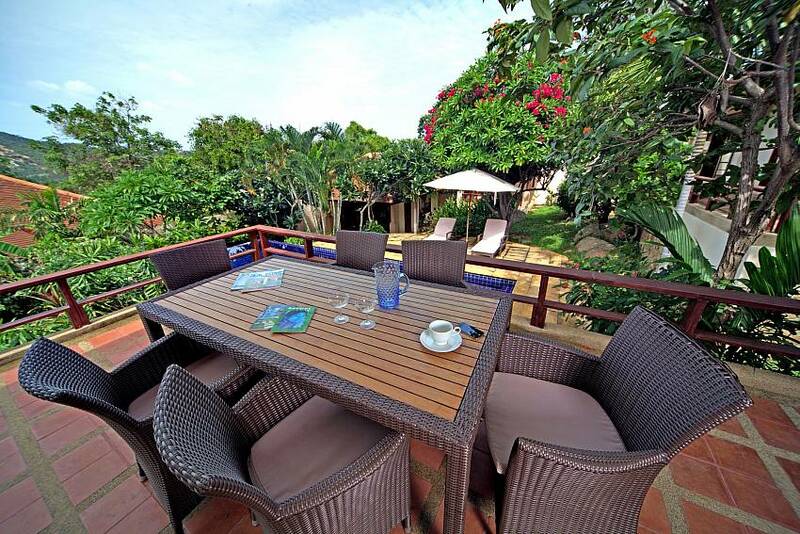 Add to this that Choeng Mon Beach is just a walk away and you are perfectly located for a wonderful tropical break. 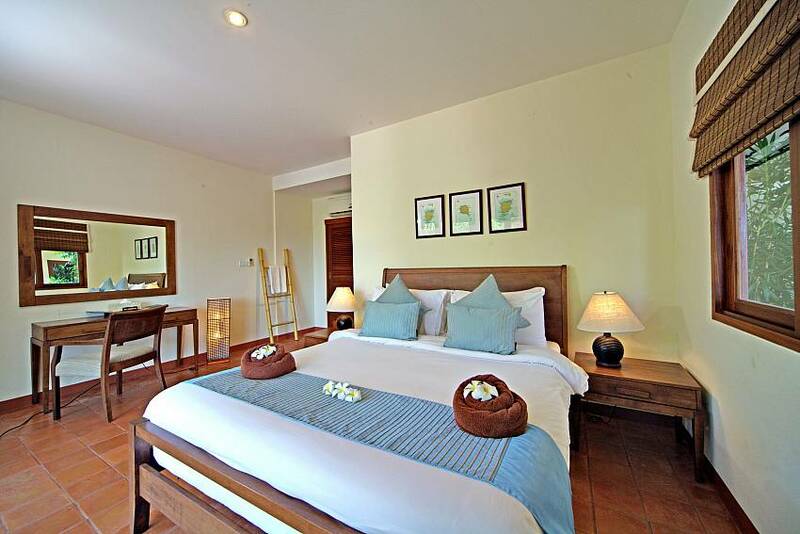 The discerning traveler will be aware North-East of Koh Samui is a calm and beautiful area, and those looking for a villa to match should take a long look at the 3 en-suite bedroom Summitra Pavilion No. 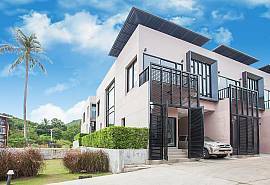 7 which is set in an elevated estate close to the gorgeous Choeng Mon Beach. 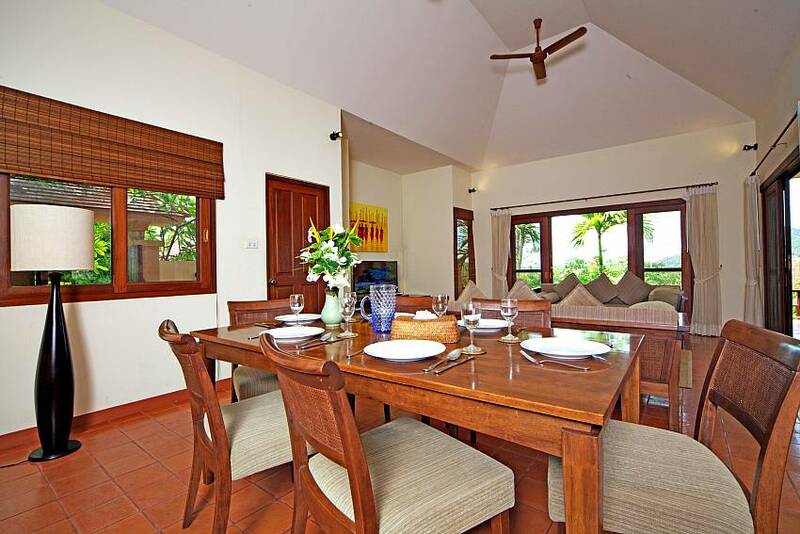 The villa sits in a tropical landscaped garden and benefits from the ocean breeze during most of the year. 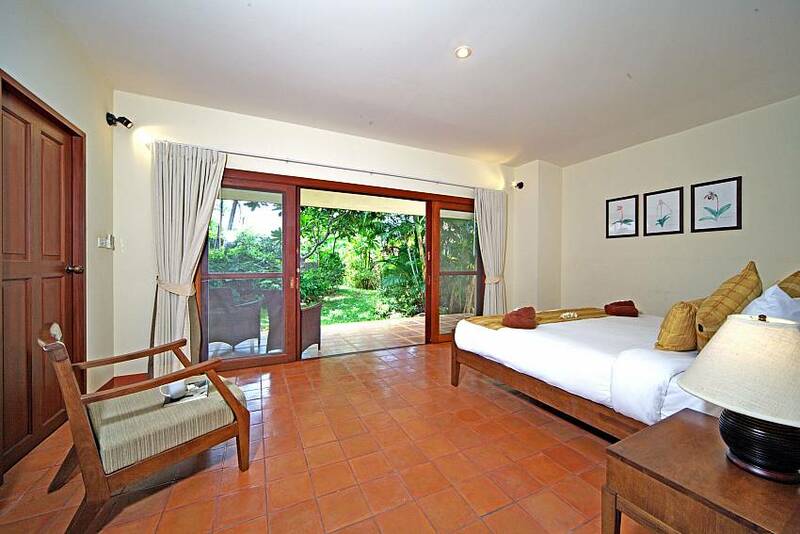 Your living and sleeping accommodation is spread over 3 pavilions and really takes things to a natural setting. 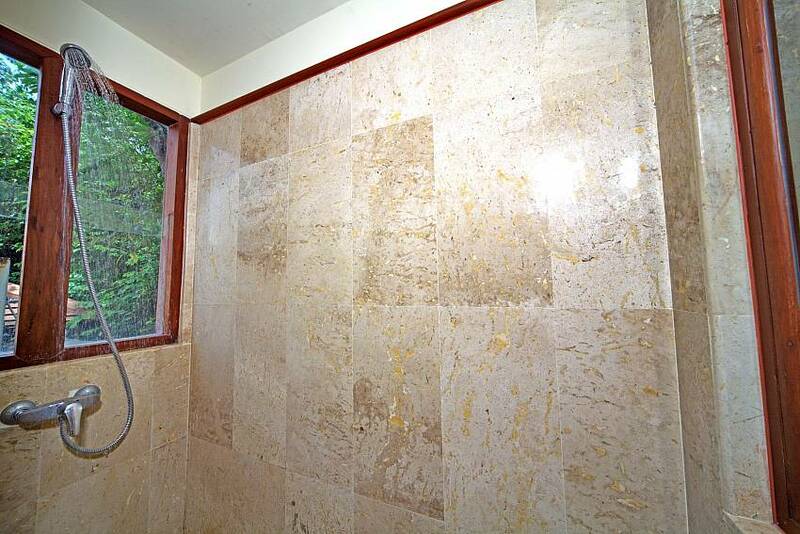 You will also benefit from privacy. 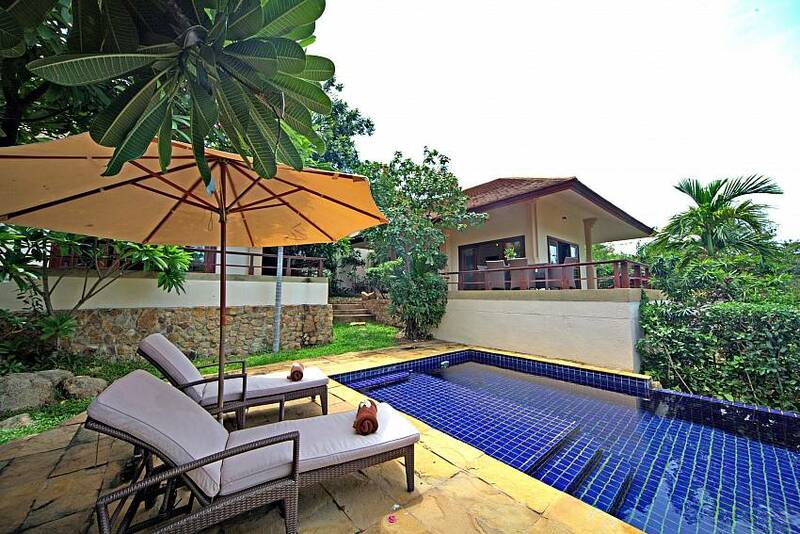 The 10 garden view villas on the private estate have been designed to ensure that none overlook each other. 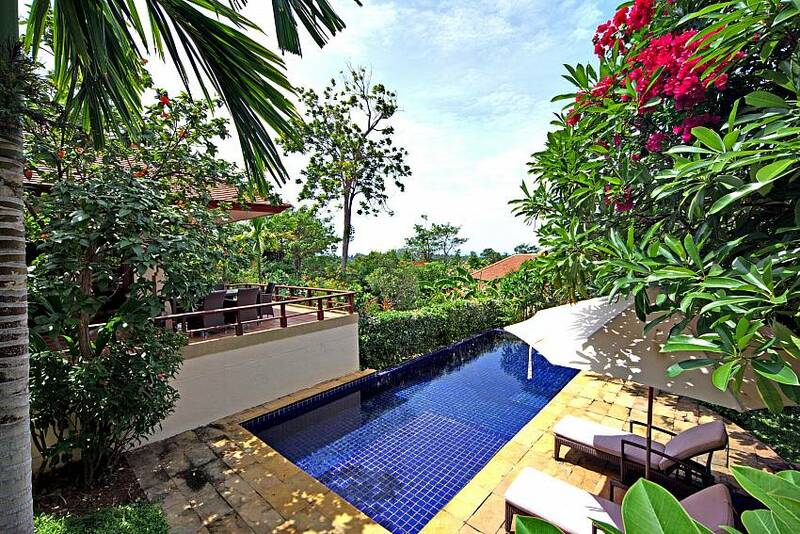 The 3 pavilions contain the master suite, the open plan living accommodation and the 2 guest bedrooms respectively. A fourth pavilion is the outdoor Sala; perfect for relaxing in the shade with a book. 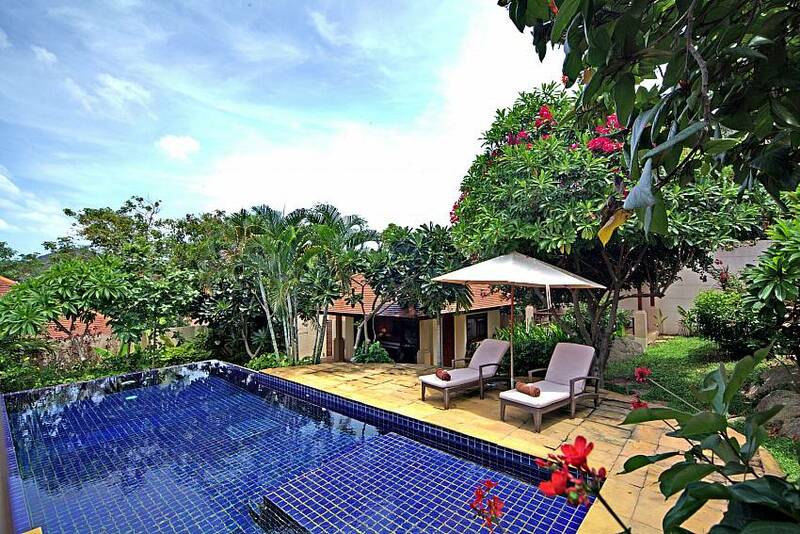 The busiest two areas of your villa will be the private swimming pool and spacious terrace. 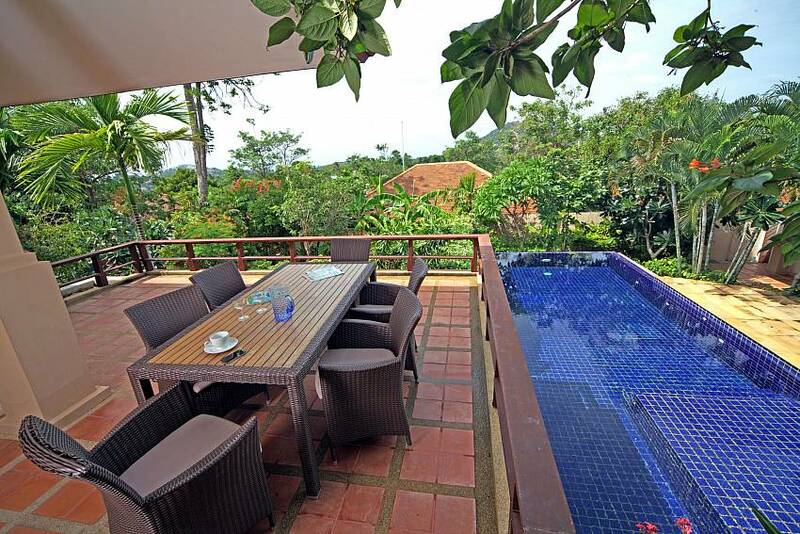 Swimming, lounging and eating go hand in hand with a relaxed break and this villa is perfect for all 3. 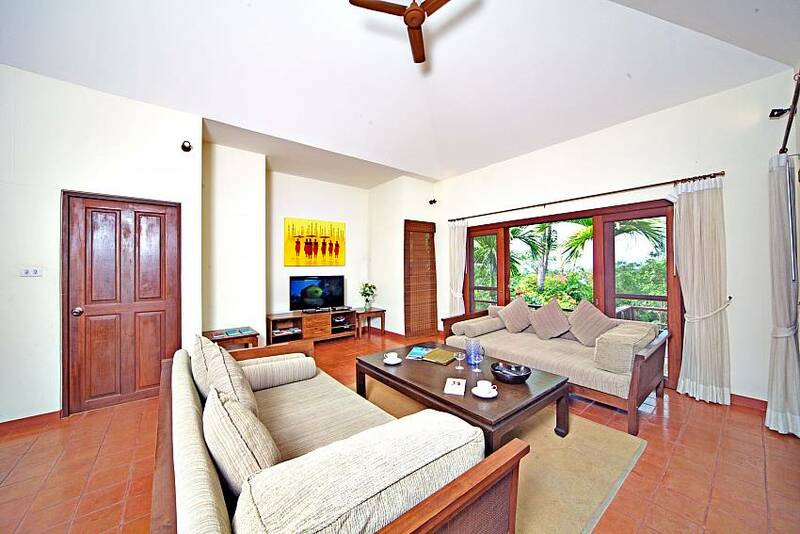 Your indoor open plan living pavilion is a comfortable space with a fully fitted kitchen, indoor dining area and a lounge space for television and movie watching. 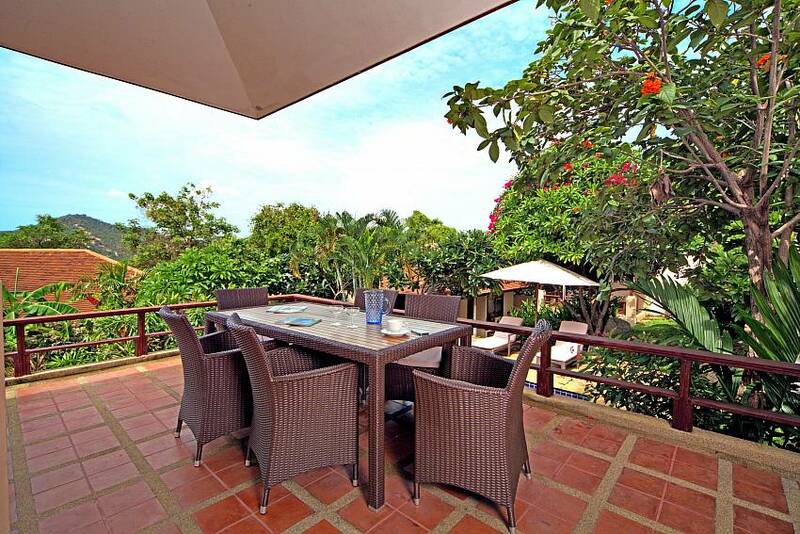 This area can be accessed directly from the terrace making seamless indoor and outdoor living yours. 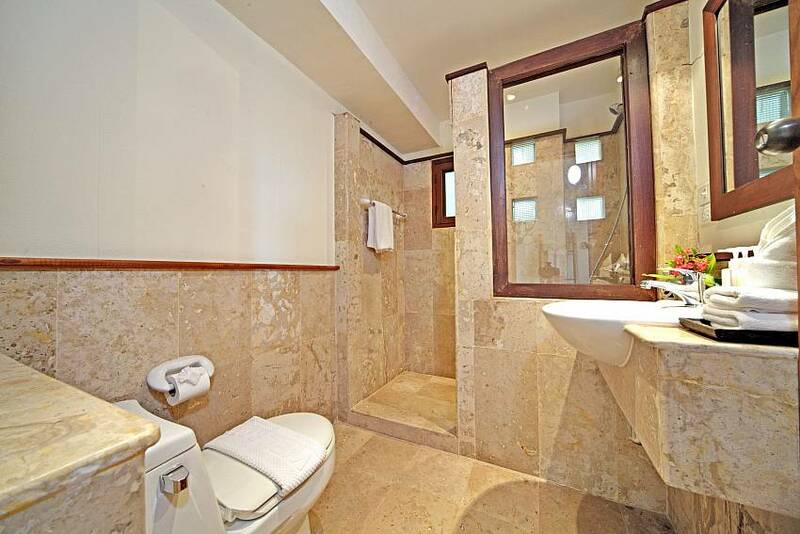 While you are fully self-contained in Summitra Pavilion Villa No. 7 the chances are that you will want to explore near and far during your stay. 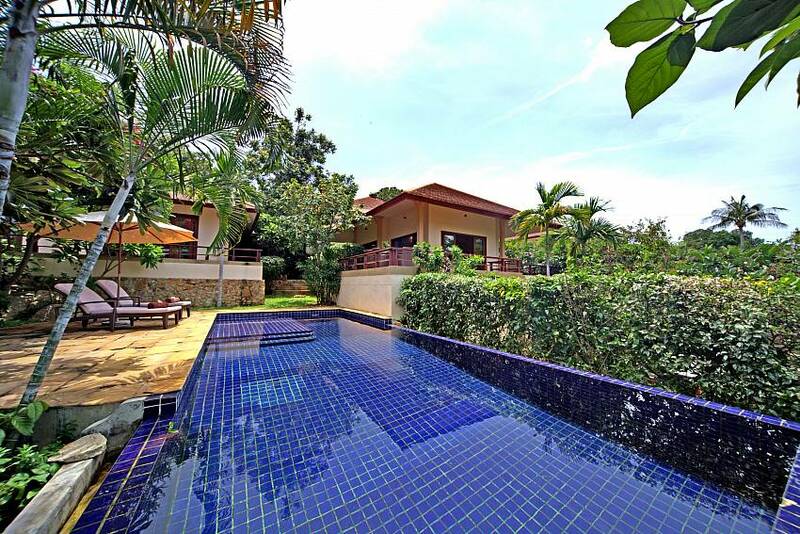 The estate is also just a short walk from the beautiful Choeng Mon Beach. This is one of the classier beaches in Samui and often overlooked by those visiting the area. What a perfect combination for you. The welcoming sands are perfect for stretching out on while the inviting water is safe for the whole family. Car hire is easily arranged and with secure parking at your holiday home for cars as well as motorbikes this option is a popular one. There are many attractions to choose from, but one at the southern end of the island makes for a fascinating day trip. A visit to Laem sor Pagoda will not be forgotten in a hurry. This is a truly wonderful Temple and surrounding natural area. You will even have the opportunity to see a Mummified Monk, one of several on the island. 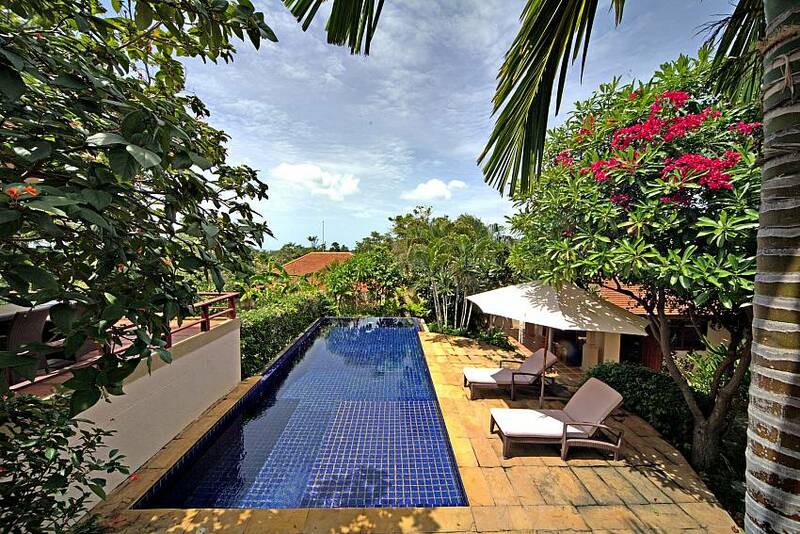 Browse our delightful range of Koh Samui villas here. 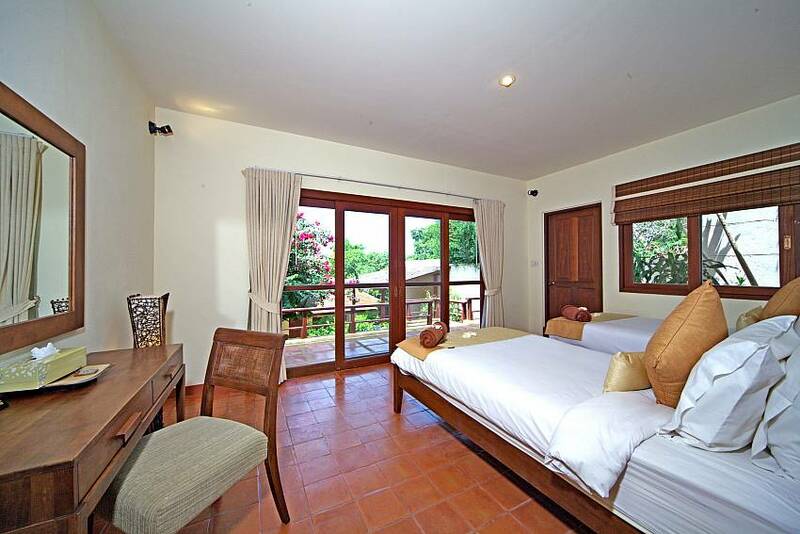 The villa has 1 master suite in its own pavilion and 2 guest bedrooms each with their own bathrooms. 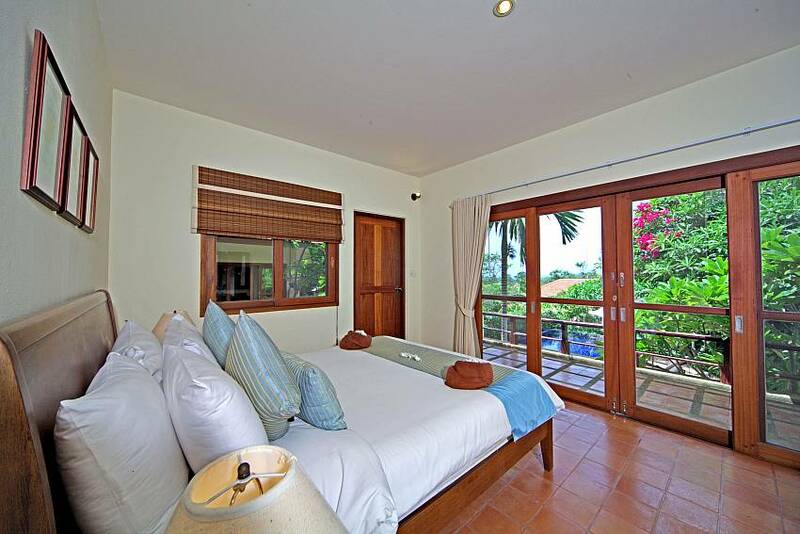 Indeed the master suite and twin bedded guest bedroom have 2 bathrooms each. One is indoors, the other in a private outdoor area. 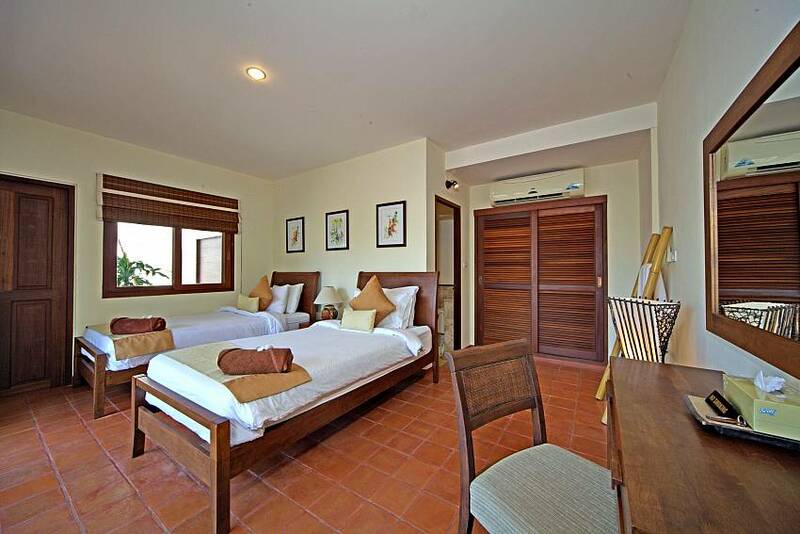 All bedrooms are comfortably furnished with the master and 2nd guest bedroom offering double beds. 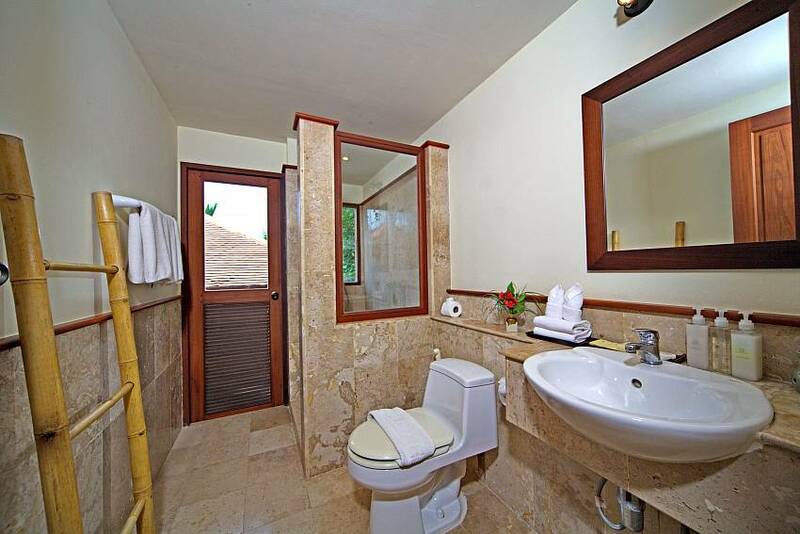 While it is officially stated you will have 4 bathrooms, three of them en-suite with your bedrooms and one for guest/communal use, you should add to this the two private outdoor bathing areas which are attached to the master suite and your 3rd guest bedroom. Those looking to get back to nature will do so in style. 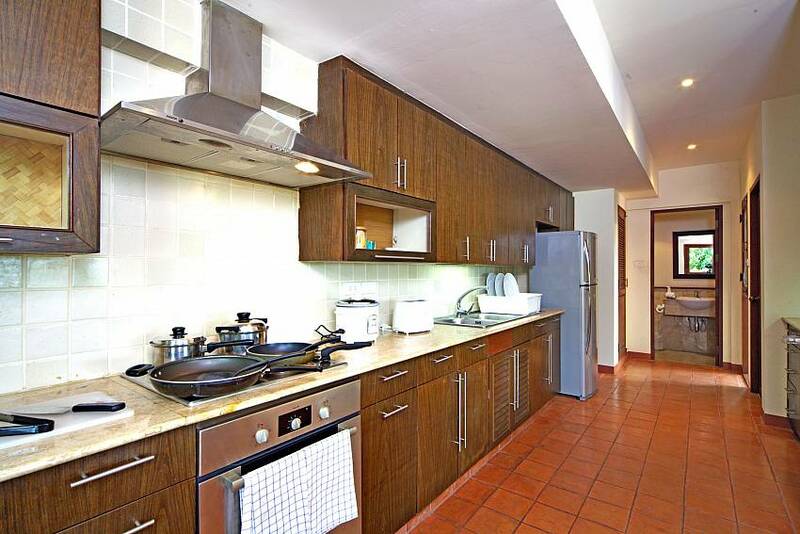 Fully fitted and part of your open plan living area the kitchen offers all appliances and cookware to ensure your party is well catered for. Local shops are close by and supermarkets can be reached in less than 10 minutes. There is a lounge in the open plan living area housing a sofa to stretch out on, while watching international TV programs or movies on the DVD player. 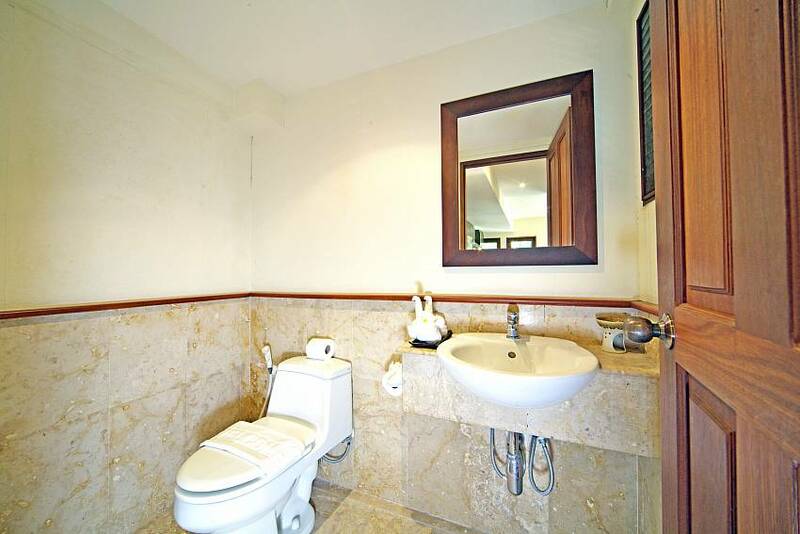 As with the rest of the villa you will also have free Wi-Fi available here. 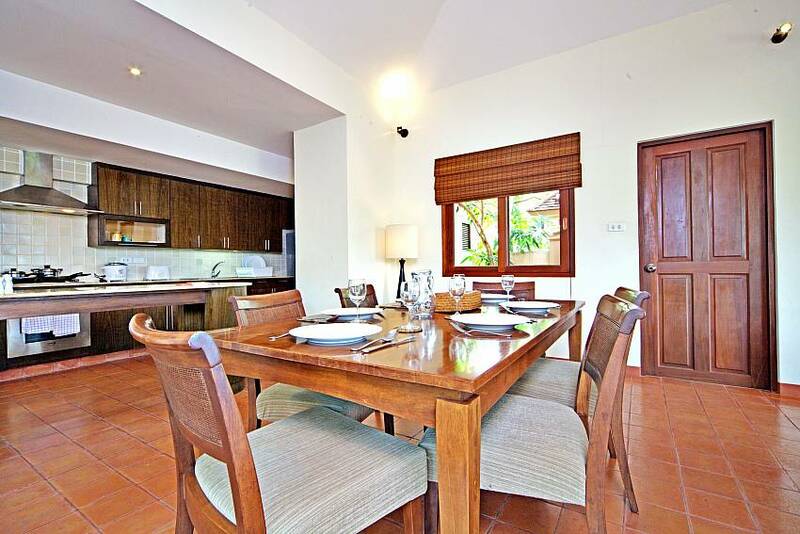 The wooden dinning suite in the open plan living area is close to the kitchen for convenience and offers a relaxed place to eat, but the outdoor dining terrace is a wonderful setting for meals. 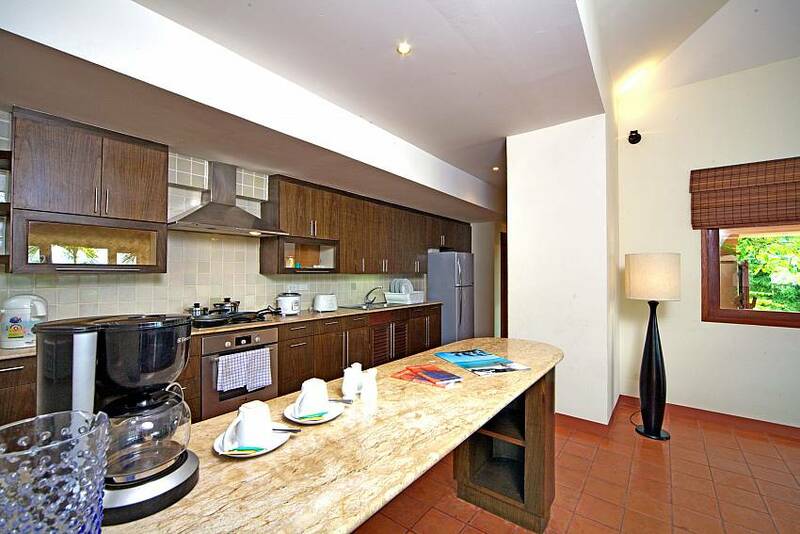 Wonderfully laid back meals will be enjoyed with views of your landscaped gardens and swimming pool.